This year the International Norton Owners Association and the UK’s Norton Owners Club are joining forces to host the Norton Empire Rally in Catskill, NY. And today I booked tickets for Amira and myself to Boston so we can shoot video of the event. We’ll be arriving on Tuesday and getting to Catskill on Wednesday night. 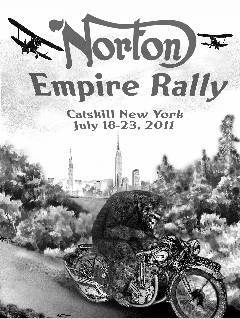 We’re really looking forward to meeting such a huge group of Norton enthusiasts and getting impressions from both sides of the Atlantic about the Dreer Norton. I hope everyone’s ready to talk to the camera and tell us why each of them thinks Norton is special. If you’re going to be at the rally, give a shout in the comments and let us know. And please track us down so we can talk to you about your Norton and why you love the marque. I have sent you a note before and will be at the Norton Rally with my son. I have a 1967 Norton Hybrid N15cs. There were only about 1,300 of the Norton’s made from 1965 thru 68. These are supper rare because they were use primarily for dirt racing in the Baja in CA. In fack Evel Kanevel use one of these for 4 jump events in 1966 as Norton sponcered him that year. I was told a few yrs back that there were only about 100 running in the world and that I had one of the best restored in the world. They are being rebuilt more now but there are still only a few that are in running order. Please look me up when you get there or I’ll find you I am on FB and have sent you a pic of my bike. My FB page is under Michael Harrod we are friends there. Mike, we’re looking forward to seeing you and everyone else at the rally. Lots to do in the next 3 weeks. Looking forward to the rally, will be on my recently restored ’57 model 77. Super rare, but I ride it (why else have it?). I may have to leave a little early to make a showing at mid-ohio. I have been emailing with a couple of Britts coming over to ride around the great lakes for 2 weeks! Skip, we’re looking forward to seeing you there. I’m with you&emdash;motorcycles should be ridden! I get that there are some incredibly valuable museum pieces out there and it would be a tragedy to see a rare bike lost to a crash, but a motorcycle that’s never ridden loses some of its magic for me.